In addition to our exhibition The Power of Labeling, we’ve recently hosted several blog posts that explored language and the power of words and labels. Porchia Moore, for example, discussed how words like “diversity” hold implicit meanings and I (Rose) wrote about how the MAH’s reframing museums jobs through the wording of their job descriptions. This week, Margaret Middleton, Exhibit Designer at the Boston Children’s Museum, discuses the need for museums to critically examine the words they use pertaining to families, as they might be functioning under an outdated understanding of what a family is. Now more than ever museums are striving to attract and serve families. Chances are, your museum is probably already offering family programming and maybe even introducing family friendly exhibits. But is your museum actively welcoming families of all kinds? Do single-parent families, adoptive families, and gay families feel welcome in your museum? A quick way to gauge this is by listening to the voice of your museum. The museum’s voice expresses the values of the museum and speaks internally through signage, visitor services folks and docents, as well as externally through marketing and PR. Does your museum’s voice sound inclusive? Adopting inclusive language is one of the first steps to creating a welcoming environment for 21st Century Families*. A family as defined by the individuals involved, inclusive across race, culture, gender, age, and marital status. Family members may or may not be biologically related, share the same household, or be legally recognized. As opposed to “nuclear family”. I use the term “21st Century Family” not to suggest that families themselves have changed but that over time the word “family” is often used as a code word for a nuclear family with two heterosexual legally married parents of the same race and their biological children, residing in the same household. Yet, according to Strong Families, “4 out of 5 people living in the US … do not live behind the picket fence—[their] lives fall outside outdated notions of family, with a mom at home and a dad at work.” Museums who aren’t actively engaging 21st Century Families aren’t serving the majority of families. One way to ensure your museum is speaking with the most inclusive voice is to lead a conversation at your museum about family-inclusive language. Take inventory of signage, marketing, web presence, press releases, scripts and training guides for floor staff and start to examine these materials with a critical eye. Inclusive language doesn’t make assumptions about the relationships between people. When you lead a conversation about inclusive language at your museum, you’re not becoming the language police. You’re analyzing the meanings (intentional and otherwise) of the language you choose to use and thinking critically about how your words reflect the mission of the museum. Ideally this exercise is about improving the culture of your museum. Be sure to invite director-level decision-makers to the discussion and afterwards document your process and make it available to everyone, participants and non-participants alike. The more staff members at all levels are involved the more likely inclusive language will become part of your museum’s culture. How is your museum trying to be inclusive of 21st Century Families? * I co-developed the term “21st Century Family” with Laura Callen, founder and director of the Adoption Museum Project and Rachel Kadner, Parenting and Community Partnerships Manager of Habitot Children’s Museum. 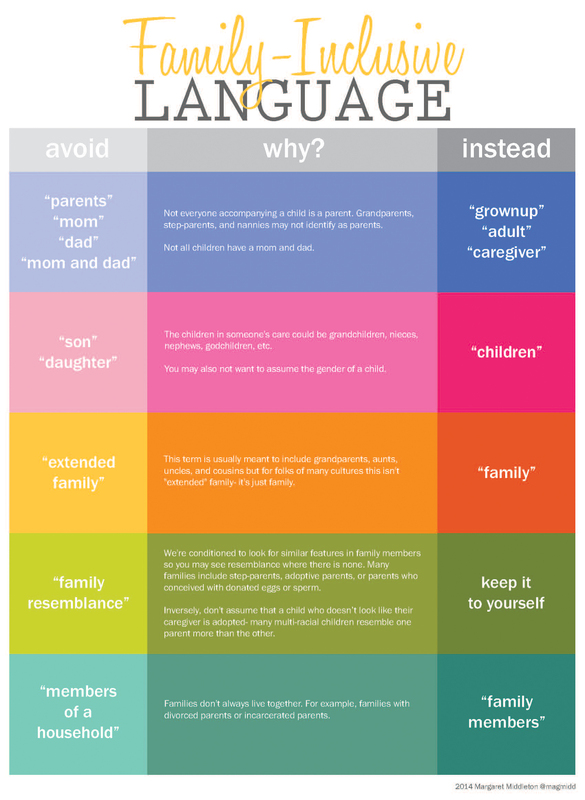 You can now purchase posters of the Family Inclusive Language guide here! We’re working on an exhibit style guide, and after reading this post, I’m planning to add a section on inclusive language. This blog post was picked up by a NPR report who interviewed Margaret about her exhibit design work. You can read the interview here: http://n.pr/1mplWMT.